Flew from Denver to Los Angeles, and then LA to Narita (Tokyo). When we landed, we caught a train to our hotel near Shinjuku, got settled, and then explored Tokyo for a few days. Highlights were ramen (duh), soba, hotel room views, Tsukiji fish market (and buying our own knives from there), catching up with Moser, and deliciously strange little mushroom chocolate snack things. From Tokyo, we caught a train up to Matsumoto where we stayed for one night before heading to the Alpen Route. 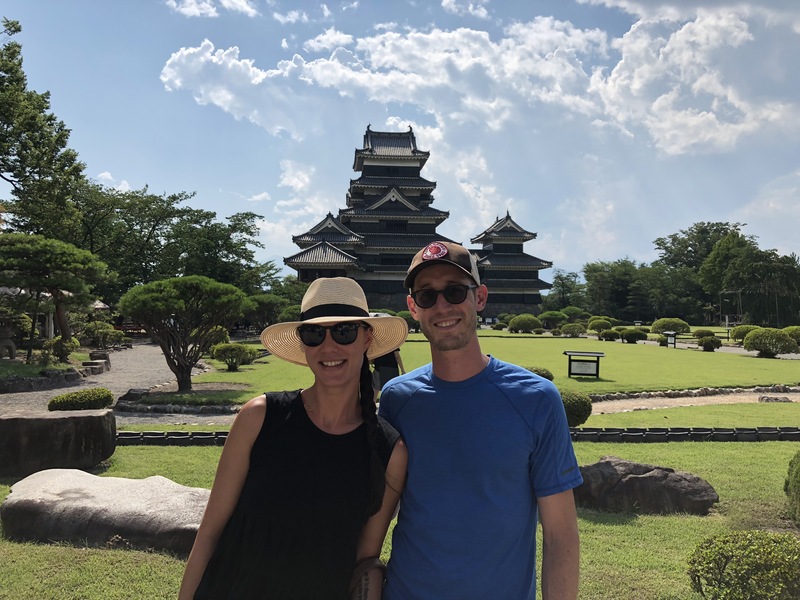 We had delicious soba noodles, visited the amazing Matsumoto Castle, dropped in to a local craft brewery, then got some sleep before a long day ahead of us. The Alpen Route is an interesting series of “public transit” systems, connected to provide passage through the Japanese Alps. It includes electric buses, a couple of funiculars, some walking (across the top of a dam), and a gondola. It’s really beautiful up there, and it was a nice way to break up our city visits, see some of Japan’s amazing nature, and also get from one part of the island to another. The end of the Alpen Route for us was Toyama. We stayed there a night and had probably the best sushi meal I’ve had in my life. It was amazing, and a very unique experience. No one spoke english, we just took what they ordered, and there were signs talking about purity and no smoking and no drinking. We also went to a strange rockabilly bar, drank beers outside a Seven Eleven, visited a trendy little coffee shop, had black ramen and strolled through another castle grounds. From Toyama, we got a bullet train down to Kyoto where we stayed for a few days. Kyoto is the city of temples, but we only actually visited two of them. We also went to some cool tiny whiskey bars in alleys, went shopping, had more great coffee, more great food, watched a Maiko (Geisha apprentice) show, and visited another awesome market (Nishiki). From Kyoto we were off into the mountains again, this time to Hakone for a relaxing retreat and special experience at a very fancy ryokan. It was more of a 5-star hotel than a traditional guesthouse, but it was a really unique experience. We had a private suite with our own hot-springs-fed bath tub on the deck with a view. It was amazing. We stayed 2 nights and were treated to absolutely mind-bending food in our own private dining room. During the day we visited the Hakone Open Air Museum which was also a highlight. Japan was really amazing, and I’d love to go back. I feel like we barely scratched the surface of anywhere we went, let alone all the rest of the country that we didn’t even touch on. It’s such a unique place in so many ways, and I really feel like I just got the tiniest taste, even though we managed to fit so much in. One day, I shall return!